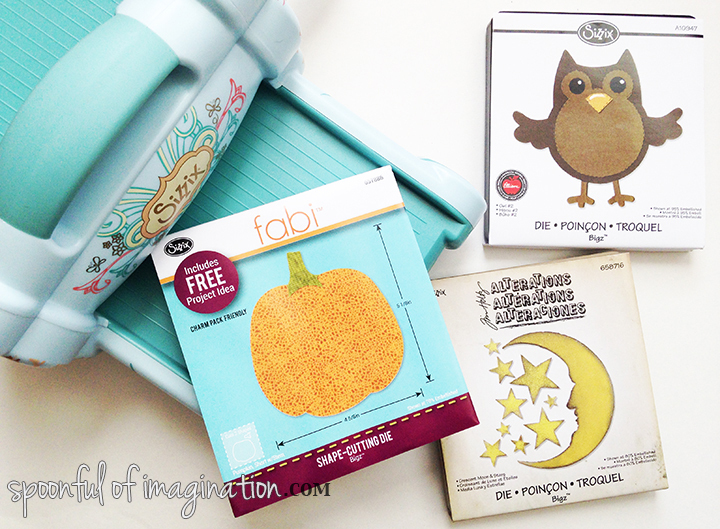 Disclosure: I received this Sizzix machine and die cuts for free, but all feelings and opinions are my own. This post does include affiliate links. Holidays and seasonal things are the perfect time to break out some fun and invest in having your children build memories they will remember for a lifetime. I have some fun neighbors and I smiled brightly when our house got boo’d last week. Have you heard of this neighborhood game before? The idea is that you put together a little bag of goodies and you leave it with a note on a neighbor’s door knob as a surprise. This is being boo’d. Once you have been boo’d, you do it for two neighbors that have not been boo’d yet. 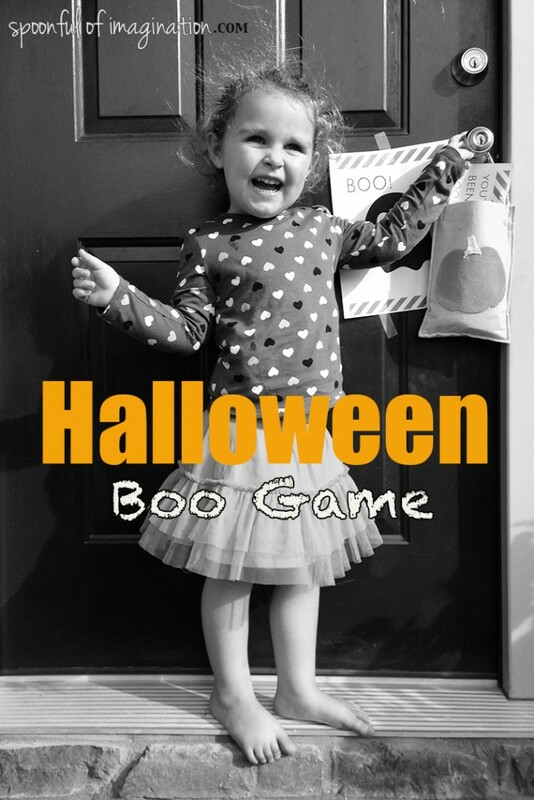 Once you have been boo’d, you are supposed to post your little ghost picture in a window, so all the neighbors know you have already been boo’d. The kids love it. Although it’s supposed to be anonymous, the kids excitedly ask one another if they got their bag. We got boo’d last week, and we had two days to boo other neighbors. 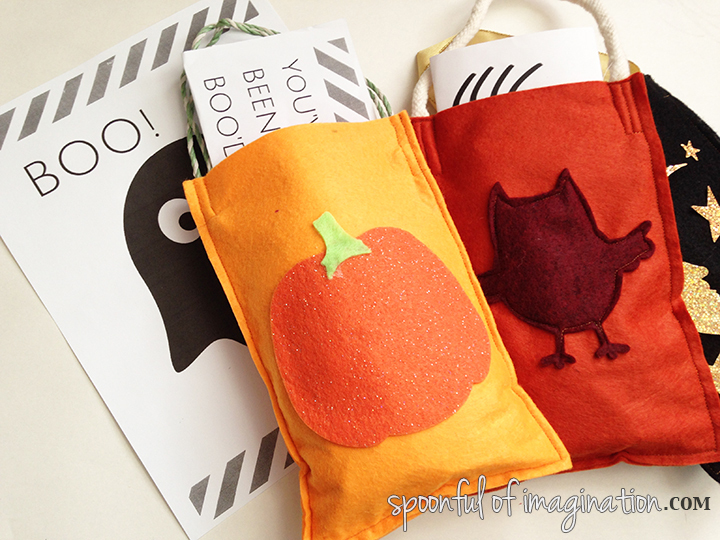 I quickly whipped up our boo bags, and I will show you how, so you can do the same. 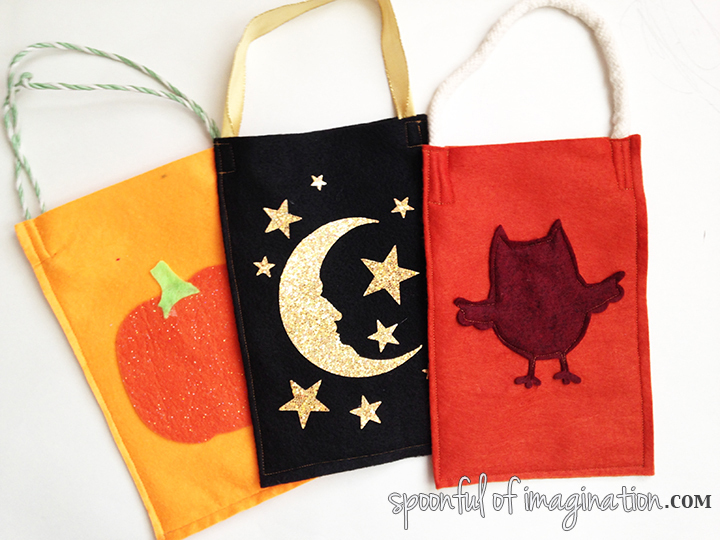 If you aren’t into Halloween stuff and the idea of being boo’d, you might still like this tutorial so you can create bags for other holidays or gift bags for any occasion. There are lots of possibilities for this craft. 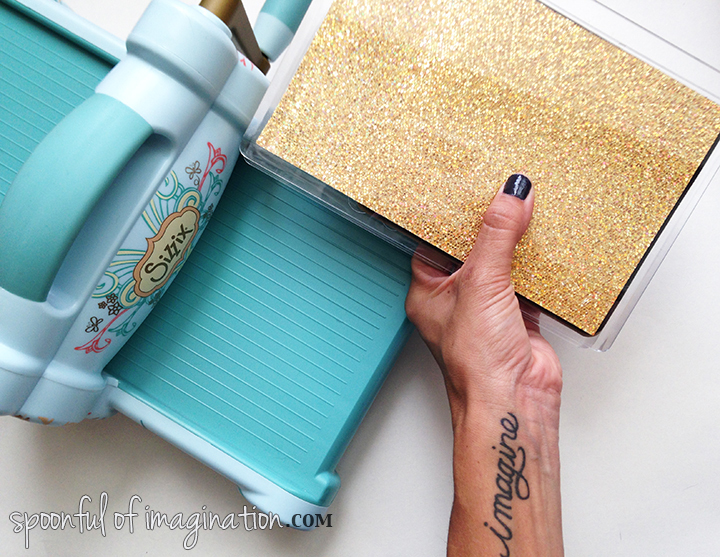 I turned to my Sizzix immediately. You might remember how I used it to create my Felt Flower Initial for my new niece (who is amazing and I will hopefully post pictures of soon). 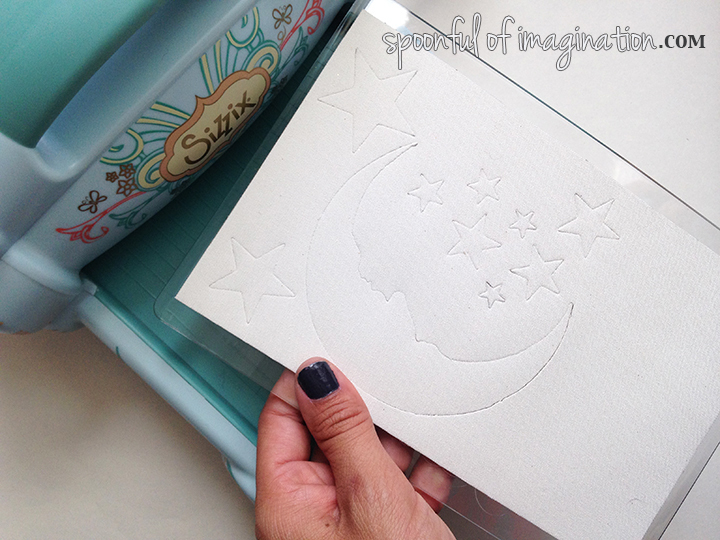 Sizzix has all kinds of amazing holiday die cuts that will save you so much time and stress on cutting out the perfect images for your crafts. 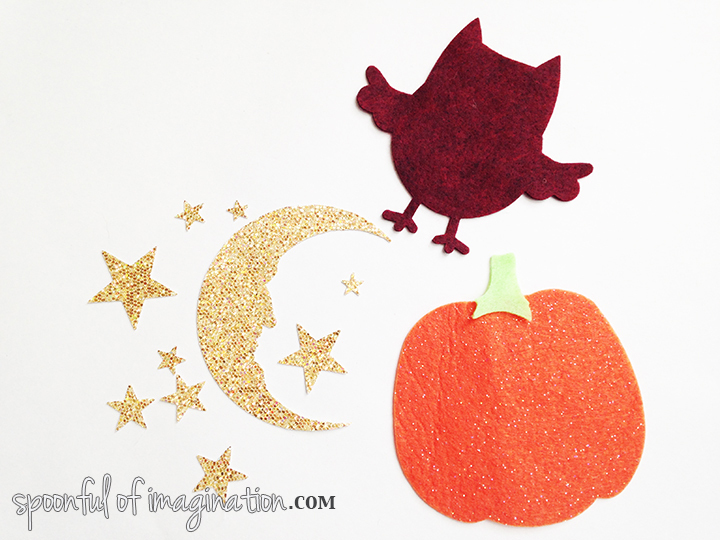 I was excited to try out a few of their fall/Halloween die cuts. 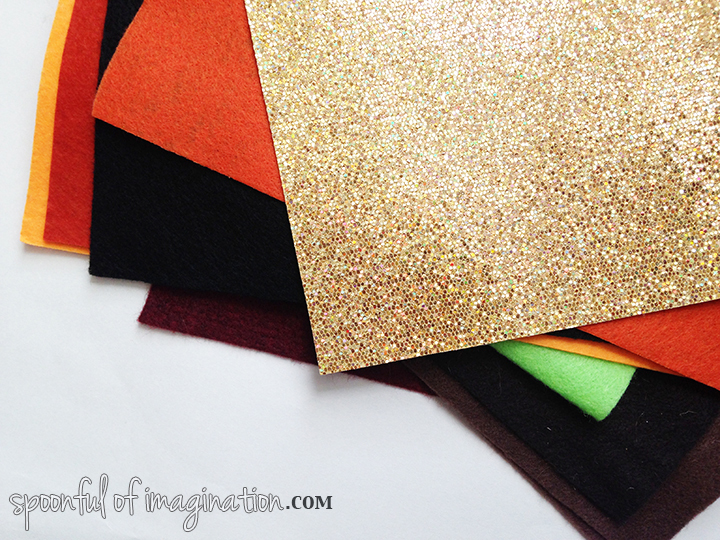 I started by gathering some felt and sparkly paper with colors that would work for my die cuts. I then used my Sizzix to cut out my shapes. Once the shapes were cut, I simply pushed them out of their design and I was ready to craft with them. 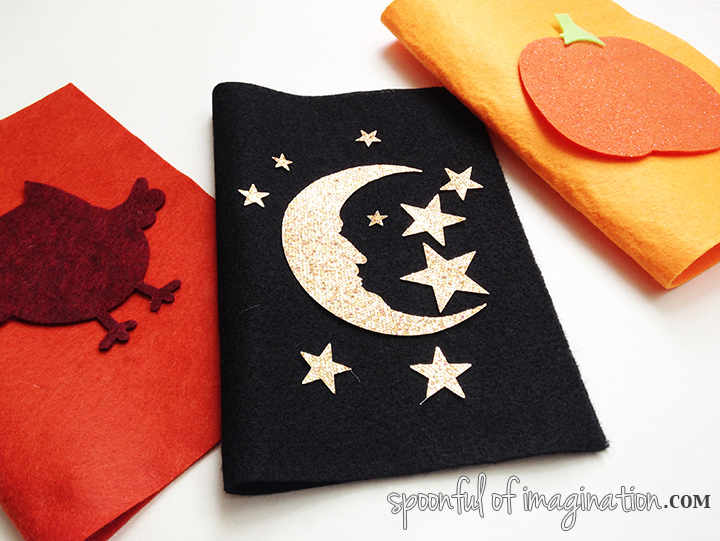 I laid each of my die cuts on a coordinating piece of felt folded in half. I made sure I liked the placement and colors working together. I then either stitched on my design or hot glued it. I played around with both ways, and they both worked great. 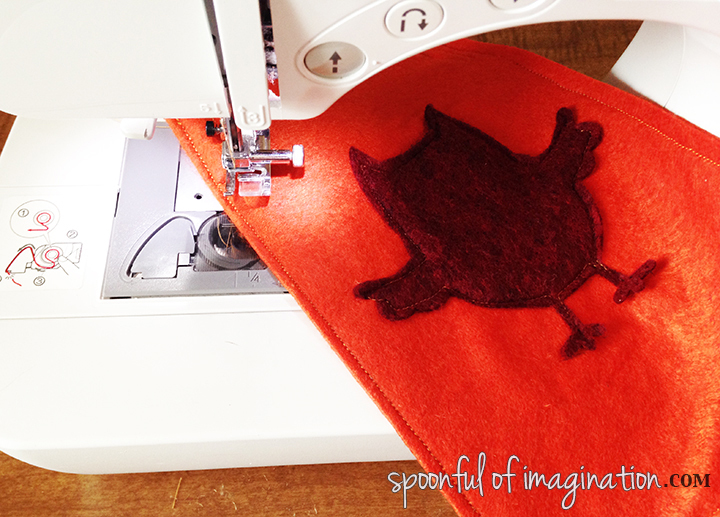 I then stitched up the bottom and side of my felt (which I had folded over) to create a bag. I ended up stitching the other side as well (even though the fold closed that side off) just so it looked more symmetrical. I sewed either some ribbon or rope into the crease at the top of each bag to create handles and they were done. They were so quick and cheap. Plus, they are cute! I love how if you change out the colors and die cuts this bag idea could be used for so many different occasions. They would make great gift bags. 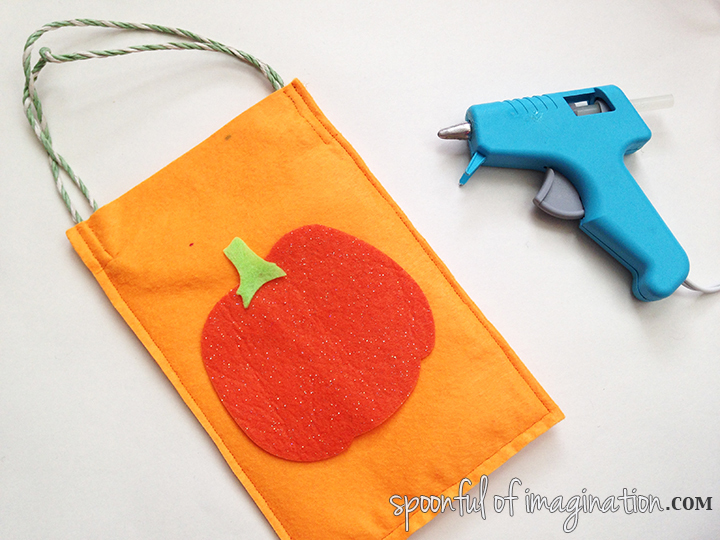 You could probably even use the idea, but instead of folding your felt in half, just sew two pieces of felt together to make a larger bag for a trick or treat goodie bag. Wouldn’t they be cute to hold birthday party favors as well? 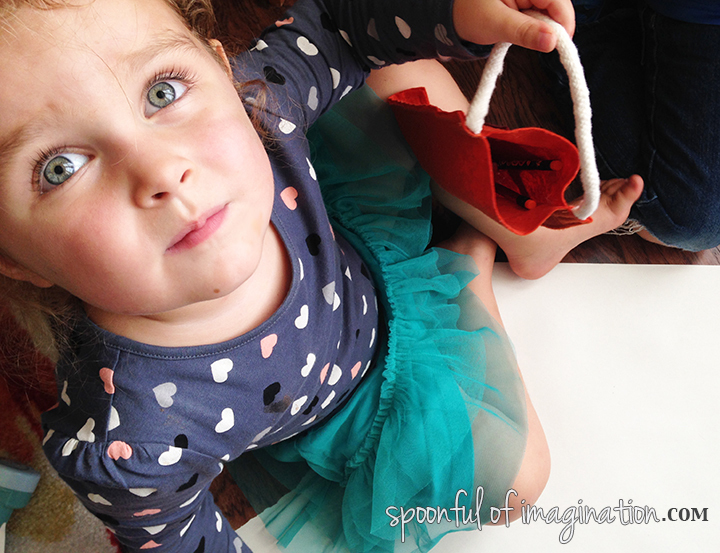 So many ideas if you use your imagination! Once our bags were created, we added some goodies and our signs. I, of course, had to find a cute helper to help me stuff the bags. 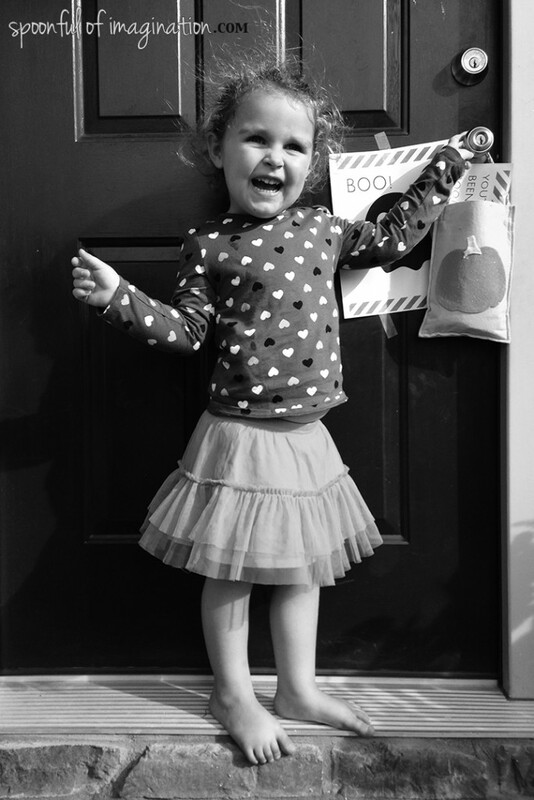 The final step was hanging our Boo bags secretly out on our neighbors’ doors. The kids were all too excited to act like spies and hurry up and down the street. Have you ever been Boo’d before!? If not, you could start this idea on your street. 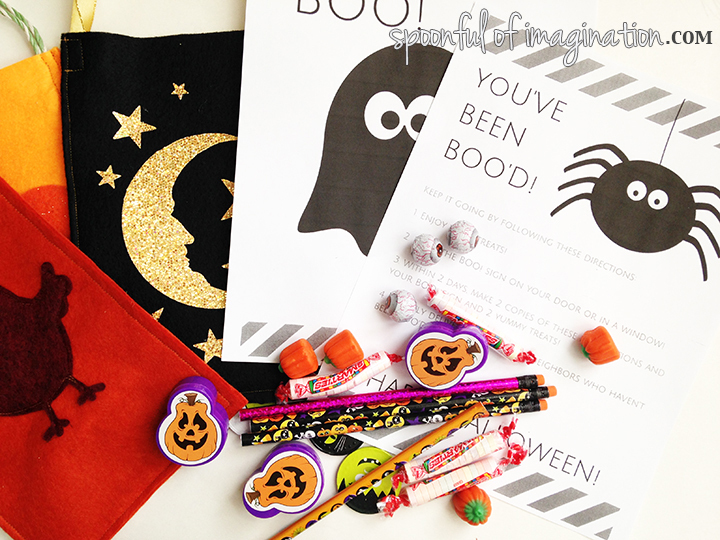 Print out a little ghost Boo sign and type up some simple instructions for your neighbors to read, attach them to your goody bag and you are ready to play! I hope you are all having a great week and are able to create some fun memories with your kids! 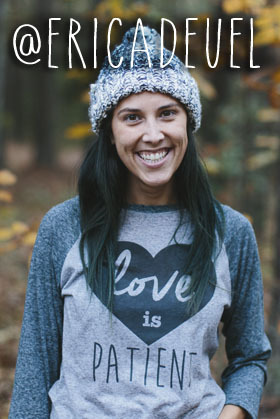 Could Rea be any cuter? those bags are adorable! The glitter moon is my favorite!